This area of the website contains links to resources about the American Civil War that I have found very useful or interesting. Books theMuse is reading discusses the books theMuse is using on one of his current projects. 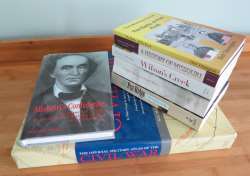 Books by theCivilWarMuse has descriptions of the books that theMuse has written. Civil War Classics from Trans-Mississippi Musings has descriptions of classic books reformatted as eBooks by Trans-Mississippi Musings. General Civil War has descriptions of resources recommended by theMuse that provide overviews of the American Civil War. Trans-Mississippi Civil War has descriptions of resources recommended by theMuse that cover the American Civil War west of the Mississippi River. Other Civil War has descriptions of resources recommended by theMuse that cover the American Civil War east of the Mississippi River.